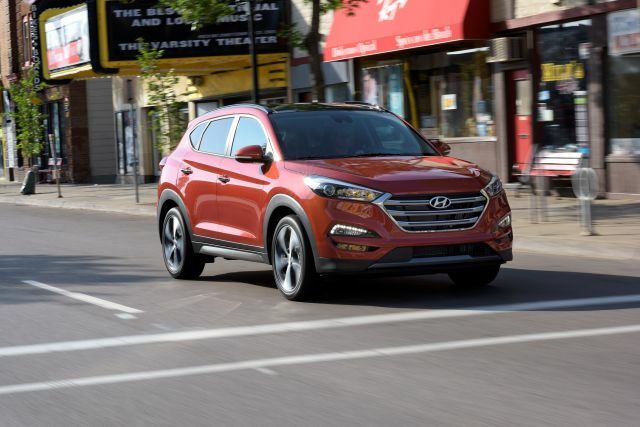 What changes will make the 2017 Hyundai Tucson different? Few, if any, considering this compact crossover was fully redesigned for model-year 2016. The ’17 will carry over the attractive new styling and better road manners that came with the redesign. Likewise, the larger dimensions, new safety and convenience features, and the more fuel-efficient engines. It’s possible, of course, that early customer feedback could prompt a minor shuffling of equipment between trim levels. And a new color or two might be offered. You probably shouldn’t, if you like the ’16. Prices almost certainly will increase, so you’ll pay more for essentially an unchanged vehicle. And the ‘17’s styling and equipment details will have a slightly shorter shelf life, given that a midcycle update is likely for model-year 2019 or ’20. If you what you want is what you see. The ’16 will indeed look fresher, longer, than the ’17. Even then, though, the midcycle facelift is unlikely to bring major changes. So this is the Tucson that Hyundai will be selling until the next-generation redesign, probably for model-year 2022. And it’s an appealing upgrade over its 2010-2015 predecessor. It has more passenger room than class sales leaders such as the Honda CR-V, Ford Escape, and Toyota RAV4. Cargo volume remains midpack, but driver manners, refinement, and cabin-materials quality are all above average. Expect the lineup to remain intact, starting with the base SE model and including the more powerful Sport and top-line Limited grades, plus the mileage-optimized Eco. All will again be available with front-wheel drive or all-wheel drive (awd). No. And that’s a good thing. It’ll continue with the automaker’s “Fluidic Sculpture 2.0” design theme adopted by the ’16 model, so it’ll again be one of the better looking compact crossovers. The redesign lengthened the body by 3 inches, widened it by 1.1, and grew the wheelbase 1.2 inches. Sport and Limited come with a power liftgate, an rare feature at this price range. The dashboard is cleanly laid out, if more generic-looking than the exterior. The design and feel of the gauges and controls would complement a more expensive vehicle. Four adults ride on comfortable seats; three across in back is a squeeze. The panoramic sunroof available on the Limited model gives everyone a great view of the sky. A solid structure and deft use of sound insulation creates a level of quietness that also feels a class-above. Expect no change to the well-controlled ride, pleasant handling, and good powertrains. The SE will reprise a 2.0-liter 4-cylinder with 164 horsepower and 151 pound-feet of torque. It links to a 6-speed automatic transmission and provides decent acceleration that’s on par with the best entry-level rivals. Other models will return with a turbocharged 1.6-liter 4-cylinder making 175 horsepower and 195 pound-feet of torque. They’ll again use a 7-speed dual-clutch automatic, a transmission type typically found in sporty cars, though this one doesn’t include paddle shifters. Gear changes are sometimes abrupt but the transmission helps get the most of the turbo’s torque for impressive throttle response and acceleration matching some more powerful crossovers. The awd system is calibrated to enhance dry-road cornering and allows the driver to lock in an even front-rear torque split to maximize low-speed traction in slippery conditions. No, so it’ll remain slightly above average for the competitive set. Expect EPA ratings for the SE model to repeat at 23/31/26 mpg city/highway/combined with front-wheel drive and 21/26/23 with awd. The Eco should be back rated 26/33/29 mpg with front-drive and 25/31/27 with awd. Look for the slightly heavier Sport and Touring models to again rate 25/30/27 with front-drive and 24/28/26 with awd. Not likely. The ’16 redesign upped the ante, and the ’17 should again be available with a nice range of standard and optional features, some of which are more commonly found on costlier vehicles. These include the Limited’s panoramic roof, standard LED headlamps and taillamps, and optional steering-linked xenon headlamps. All models will again have LED daytime running lights, heated mirrors (with turn-signal indicators on all but the SE), a rearview camera, alloy wheels, and Bluetooth connectivity. A power driver’s seat with power lumbar should remain optional on the SE and standard on all other models and you will again be able to order any version with a windshield-wiper deicer. Likely to remain standard on and exclusive to the Sport and Limited are keyless entry with pushbutton start, heated front seats (cooled front seats and heated rear seats as a Limited option), and blind-spot and rear-cross-traffic alerts. Apt to remain exclusive to the Limited is a navigation system (as standard) and an optional safety suite of lane-departure and backup warnings, plus automatic emergency braking with pedestrian detection. Hyundai will sometimes hold the price from year to year on certain models. But Tucson competes in a hotly contested market segment experiencing record demand, so some increase to 2017 prices is quite likely. They should be nominal, however, rising over a 2016 base-price range of $23,595-$32,195. (Note that base prices quoted here include the manufacturer’s destination fee; it was $895 for the ‘16 Tucson.) Expect the SE to start around $23,800, the Eco around $25,300, the Sport around $27,300, and the Limited around $31,100. To those estimated base prices, you’ll need to add around $1,400 for awd. Ford Escape, Honda CR-V, Jeep Cherokee, Mazda CX-5, Nissan Rogue, Subaru Forester, Toyota RAV4, Volkswagen Tiguan. Note that the Kia Sportage from this South Korean’s corporate partner is based on the same understructure used for the Tuscon. 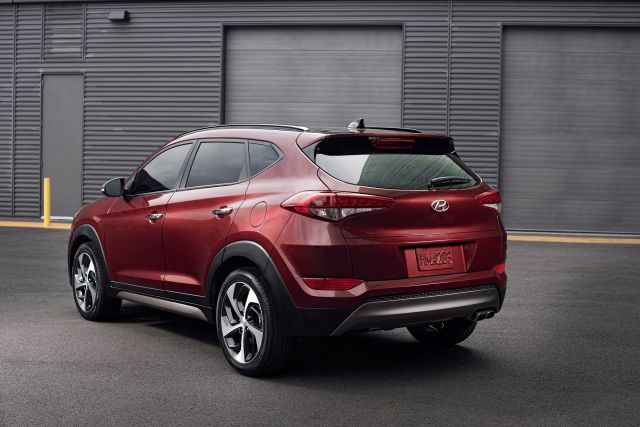 Sportage is being redesigned for model-year 2017, adopting many of the same structural changes made to the 2016 Tucson. Sportage, however, has distinct styling and different engines, a 181-horsepower 4-cylinder and a turbo four with 241 horses. Buyers would benefit from some migration of Limited-model features to the Sport, primarily a navigation system. Several competitors make multiple models available with this important amenity. A few also offer leather upholstery on more than one trim level, so spreading that perk beyond the Tucson Limited would be nice. And SE and Eco owners would surely appreciate the convenience of keyless entry with pushbutton start; it was confined to the Sport and Limited for ’16.